We are located at 906 Main Street in Williamstown, in the center of the Williams College Campus; we have a small parking lot located behind the church. From Main Street (Route 2) enter Chapin Drive. If this lot is full, you may find parking on Park Street or Spring Street, or in a nearby campus lot. The closest campus lots are behind Chapin Hall, the Thompson Chapel lot located behind Hopkins Hall, or the Hollander Hall Parking lot. 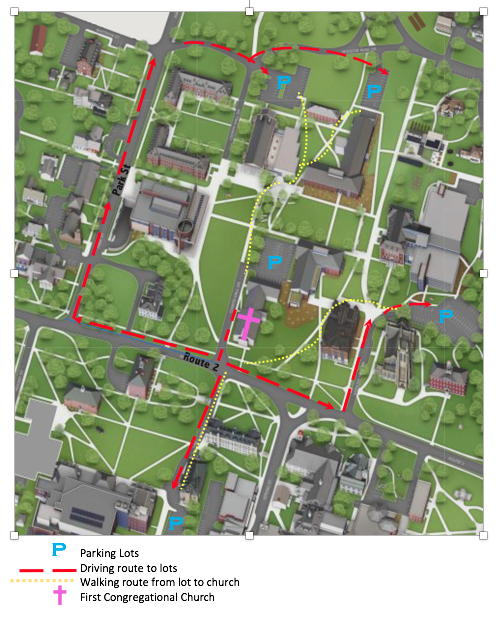 Download a printable pdf of the parking map here.